Kate Lowish (left) and Tammy Smiley, seated under one of the attractions in their new business, are excited about the opening of their new business, Edgefield Trading Company, which as an acroym is ETC! There’s a new shop on Edgefield’s Courthouse Square located in one of the town’s historic old buildings a few doors down from the Town Hall and across the parking lot from the Old Edgefield Grill. The Edgefield Trading Company opens on Friday, September 28, offering patrons a wide selection of antiques, home décor, gifts, and consignments, ETC! The structure hosting the new shop was built circa 1894 and served as a tavern with rooms to rent on the second floor. A local business man, H. H. Sanders, purchased the tavern around 1910 and turned it into a butcher shop. Norman Youngblood, an African American, was the butcher or “beef caterer” as he preferred to be called. He was a well-known and much beloved figure in Edgefield, serving as the village butcher for over sixty years. In 1918 Mr. William T. Reel purchased the butcher shop and expanded it into a very successful general grocery store. Helen White Feltham, longtime resident of Edgefield, remembers living upstairs around 1937/38 as a small child with her parents, who at that time owned the pool room located then where Ace Hardware is today. She remembers sitting on the lap of Mrs. Reel at an old plantation desk that was where the current desk is located, learning to write her name. In the late 1970’s the building was purchased by Bill Jackson, scion of one of the oldest mercantile families in the county. He continued to operate the grocery business for several more years. Later he converted the first floor into an antique store and restored the second floor for his private residence. Situated in a prime location on the southwest corner of the Square, this grand old building has witnessed the ebb and flow of Edgefield’s colorful history as it took place beyond its giant front windows. This week it begins its journey into the future with a handsome new look and a welcome mat for all to cross over. 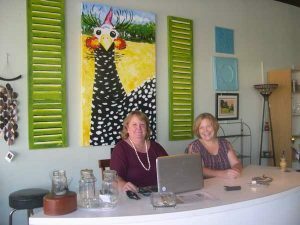 Co-owners of the new shop Tammy Smiley and Kate Lowish, both from Edgefield, are excited with their new venture. Both have recently lost parents and have an abundance of items that will be coming into the store as houses are downsized and sold. As Kate pointed out, “We’ve met numerous people who are in a similar situation and have items they just can’t fit into their own homes that are looking for a place to sell them to someone who will cherish them; hence this is what started our journey.” Store hours are 11 to 5 Tuesday through Friday and 11:00 to 2:00 Saturdays, taking in consignments prior to store hours by appointment.